I just played MewYou and saw that Keldeo's sprite was tiny.WHY? That bit about Sun and Moon would be a perfect help post, just go into a little more detail on what you did with those files and what kind of errors pop up. I'm glad you Liked MewYou! I don't know what you mean by a tiny sprite though? I don't know what you mean by a tiny sprite though? That's the default sprite from Pokémon Essentials. If you want you could try to add these sprites in yourself, just to make the keldeo sprite bigger. that's if the default sprite is a problem. Okay.. So I haven't posted on here before so bare with me if you can. So, I've been holding on to a Pokemon game idea for a while now and I've been wondering to myself if it was good or not. The game would be called "Pokemon: Clash of Champions". Your player character, Cynthia, Steven, and your two childhood friends arrive in the Oneric region, where you and your friends decide to participate in the region's annual "Clash of Champions" tournament. The normal gym system is replaced with a five round tournament system. Three random trainers, an important trainer, and the Arena Leader. Those are the basic ideas that I have. If anyone wants to help in anyway, I'm all for it. I think straying from the normal gym system is something often pondered but never really executed. If you can pull through with it, im sure just the arena system will provide a fresh experience for players, well, if done neatly. Though I have to say, this post leaves a lot open. There's really no plot, or conflict, though i do understand if you just wanted feedback for an idea youve been playing with. Overall, if you can think of an interesting story to back this up, id say it has good potential. So my idea has some pictures to go along with it, so sorry if the pictures seem small. You're a teenage boy/girl that just moved into Timberwolf Settlement, eager to start your journey to see the beautiful sights of the Prisma Region. Luckily, just past Route 1 is a Lab, taking volunteers for an updated survey of the pokemon living there (the pokedex ohmygosh). Normal 8 badge system, nothing special... Includes new pokemon. The conflict for this story is basically this... After your first badge or so, you encounter a strange hooded figure, pale, dark clothing, and speaks like an 80's robot. They tell of a time where everything was much more simple, straightforward, dull sounding... They plan on awakening the Ancient Pokemon of Monochrome to put an end to all the color, and create a world that once was, full of nothing but black and white. Appalled by there evil intentions, you also seek the help from an ancient pokemon. The Ancient Pokemon of Color. With its help, you can defend against the colorless future that awaits Prisma. 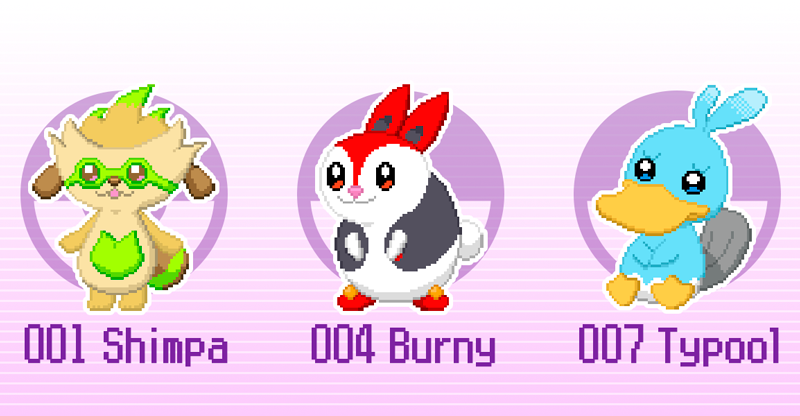 These are the starters so far, subject to change, but for this game im not really going for a gen 2 look, hence why there is no dithering apparent. From left to right - Steasaur, Paddlon, and Folirat - again, subject to change. The next pictures are of the maps and tiles, theyre small i know, idk how to take proper screenies, so if you have some tips, that would be nice. The Maps I want to be colorful, but not too colorful, meaning i want things to be pretty to look at without a bunch of clashing colors. The maps have locked edges, and are usually split up into smaller maps. This is all just to make things easier on me since im a graphic artist, not a mapper haha. BUT, that doesnt excuse the fact that i want to make an appealing game. So any suggestions are welcome. My last project was the pits, so any help i can get with anything would be totally awesome. So that's my game so far, again, not every little detail was mentioned, just a gist of whats included. Feedback is greatly appreciated. It's really good! And thank you for the feedback. And yeah. I wanna keep the conflict secret until I can get a team going on. I personally just take a screencap of my whole screen (fn+Prt Sc on most computers) and then crop it out in an image program-makes it easier for me to not have to track it down in my files! Not sure if this is the place where ideas for new games can be posted, but...here goes. I've got a really cool idea for a "Pokemon Snap" sequel, titled "Pokemon Snap 2: Family Album". In this game, you play as a Mew, and the way to add Pokemon to your album is thus: use Transform during battle, then defeat said Pokemon. Also, to encourage the collection of Pokemon for your album (and discourage excessive grinding), you'd level up once every time you "capture" 7 Pokemon (instead of gaining EXP per battle). You start at level 10 (the level Mew normally learns Transform, IIRC). Therefore, to reach level 100, you'd have to capture 630 Pokemon (the vast majority of the gen-5 Pokedex). There would also be rewards for capturing additional Pokemon upon reaching level 100. I'd have to figure out a decent motivational factor. Not sure how the gyms would factor in, but I need something to add depth to this exploration-based game. Otherwise it'd get kind of boring if all you ever did is run around and fight random battles against wild Pokemon to add them to your album. I do know that level scaling should be used (to prevent you from just one-shotting everything once you get past, say, level 30). The first question I had is why Mew would catch other Pokémon. And why by using transform. I would sort the setting out ... because the setting of a game is really important for the player to be able to get into the game. Maybe I'm just dumb though or you left something out in your description ... either way just make sure to make the ingame world consistent. The way it works there is that you don't capture the Pokémon but befriend them through playing/fighting with them. One of the games' goals is to befriend every Pokémon in Poképark. The game is pretty fun actually ... it works so well because there are different mini games that you befriend pokemon and by adding a new mini game here and there they keep things new and interesting. The thing they do to encourage you to find new friends is to have side quests that are only unlocked if you have a certain amount of friends. If you speak to them before they say something like: "I don't want to play with someone as unpopular as you. Come back when you have found 40 friends." Plus there are minigames(different from the ones to befriend them) that you can play with your friend characters and if you don't have them unlocked their shiluettes are shown so you know they are in the game. The last 2 points are showing the player that there are Pokémon they can befriend as subtile motivation without forcing him to. I don't want to say do it as Poképark did ... but maybe some of the things they did aren't too bad to implement in your game. To the gym thingy: why would Mew challenge gyms? That's something human trainers do. The enemy Pokemon aren't technically captured, but simply "added" to Mew's album. But, to do so, requires taking a "snapshot" of them by using Transform, then defeating them in battle. The Transform mechanic is the closest thing to taking a picture of a Pokemon that I think RPG Maker XP or Pokemon Essentials will allow. In this game, you play as a Mew, and the way to add Pokemon to your album is thus: use Transform during battle, then defeat said Pokemon. Mew has to know transform, and use it. Every battle at some point is going to be a Pokemon versus itself. Basically when it comes to progression, my optimal strategy would be to wittle down my opponent's health while as Mew, transforming at the last moment; I'd use this strat becasue there's no telling what moveset I'd be stuck with after transforming, which can easilly be something that does no damage. A Pokemon with an ability like Flash Fire, but it's only attacking moves are Fire type? Or just any Pokemon who's only attacking move is of a type they resist, like a low level Sandshrew with Poison Sting, Sand Attack, and Defense Curl. I think to make this work without being too monotonous, Mew should either have to defeat the Pokemon to get a Snap, or separate the two requirements so they don't have to be fulfilled at once. The concept I now have is this: you're a rogue Mew who is trying to stop the whole "collect 'em all for the Pokedex" nonsense you've been shaking your head over for the last 20-some years. You've finally had enough, so you have to gather your own "army" to try to put a stop to it. The risks are high, considering how if either you or any of your allies are defeated...they're captured. Enemy trainers can use Poke Balls at any point (no, they won't use Master Balls, that'd be blatantly unfair), so you have to keep your Pokemon's health in check. There will be a mechanic where you try to break out of a Poke Ball to avoid capture. I have an idea for a fan game called Pokémon Indigo that may or may not get made one day, and I want to see if it's generic or genuinely good and fun. It has some spoilers, as it is a synopsis, but then again this might never get made. I hope you like it regardless. You're a Trainer from Goldenrod City in Johto, and you receive a call from Professor Elm. He says that you need to come to New Bark Town, as he needs to tell you something in person. When you get to his lab (by car) he tells you that he has received a call from an old friend of his about the secret region that he lives on. He says that something has gone wrong there and that you need to go there to help his colleague. 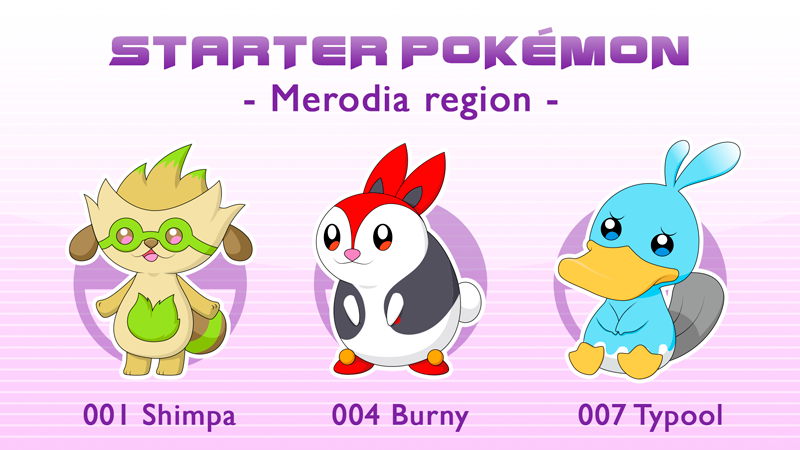 So you pick a Gen 2 starter and travel to the region of Chippea (based off of the real-life state of Michigan). When you get there you find a trainer in a blue hoodie named Lucas and his Lugia. He tells you that he is the colleague that Prof. Elm talked about. He is the resident Professor and Champion of Chippea, and after you get all 8 badges, you can come back and fight the Elite Four. He gives you a starter and sends you off. You explore a region full of Fakemon and battle through 8 tough Gym Leaders, while also finding strange people in white uniforms emblazed with a golden "U". They fight you with seemingly no care or abandon for their Pokémon, as many of them use Explosion and Self-Destruct. You later find out that they are Team Ultimatum, an evil team with the intent of capturing Legendary Pokémon to use as weapons and tools. They end up summoning the game's Legendary, Indigium, and with the help of Lucas you defeat them and catch Indigium. Afterwards you fight the E4 and the rest of the world finds out about Chippea and you and the E4 have to fight one last epic battle against Team Rocket to save the region. Of course the story isn't complete, but hopefully you get the idea. I think this is a bit generic. Granted you have some interesting ideas there, but I don't see a point in starting in Johto only to just be taken to Chippea. Additionally, it seems anti-climatic to have the professor be the Champion as it can be quite fun sometimes to have the Champion be someone mysterious you don't know well, example Steven/Cynthia/Diantha. The motivation of the evil team and their involvement with Legendaries is something you see in every Pokémon game, why not make it a bit more interesting? Also why the Team Rocket at the end? They have nothing to do with the plot. Why does the player have to receive a call from Professor Elm to come get to the chippea region? Maybe, because the player already played your game that took place in Johto?? "You're a Trainer from Goldenrod City in Johto, and you receive a call from Professor Elm. He says that you need to come to New Bark Town, as he needs to tell you something in person. When you get to his lab (by car) he tells you that he has received a call from an old friend of his about the secret region that he lives on." I'd suggest making Chippea the "second" region you go to, a la Gold/Silver/Crystal's Kanto. It's kind of sudden to just whisk the player away to a completely unknown region they're not prepared for. Sure, that makes for a decent "Survivor" plot setup, but if it's just an everyday core-series Pokemon game, I'd give it a pass. But I like the name Chippea for your new region. Thank you guys for all the constructive criticism, I'll respond to each post as good as I can. A common theme here is that I should take out Johto and Team Rocket, which I probably should, but I do think that your point about Lucas is very valid. My biggest inspiration for him was Lance from Gold/Silver/Crystal and I do have a throwaway Professor to use instead of him. The motivation for Ultimatum was something along the lines of "all Pokémon are tools and should be treated as such" but I haven't really fleshed that out yet. That is an amazing idea that I unfortunately probably won't use unless I want to make a prequel. That said, I might build off of that in a different game if I feel like making one. And that's all of 'em! I'll post the second draft here when it's ready. Hello everyone, me and my friend are working on a fan game based in Essentials, it will called Pokemon Fierce Melody, and the Region will be Merodia. I am a new developer and I am trying to make an rpg combination of JRPG+Pokemon . Game is turned based 2D sideview. (Made with Game Maker). The ideea of the game is instead of having pokemon vs pokemon battles ,you are a sword wielding female that fights pokemons to eat them ( it is not gory).Character growth is based on what she eats and not equipment based. For example if she eats a pikachu part she will gain thunder resistance and other base atributes like attack+speed. Combat system will be complex.As you should calculate what skills will make you benefit the most. As I will also implemented some atribute steal skills and buff/debuffs and also restraining elements. I was wondering if you guys would like this ideea of game. Development is mid stage with over half of the functionalities implemented.I just want to know if you would like to see it happen. I can also post some screenshots. People call me adorable for some reason. Hello! I'm working on a fangame called Pokemon Divulgence. And I'm still working on lore stuff, but heres a big chunk of it I would like a bit of feedback on. I mostly want to know what kind of questions come to your mind when reading it, that way I can write something to answer that question and fit with the lore. Long lineage of kings and a war. That war was called The (Saogheil) War. But that's not the full truth, there was another war, one no one talks about, forevee forgotten and hidden. A war between worlds. (Character name) wants war, through the game he starts creating conflicts and acquiring power, people think he wants to start a war like the first one. But thats not true. He wants to restart the forgotten war and continue it. Destruction of a region is nice. But the breakdown of worlds is better. They aren't originaly from this world, they are "leaks" from the other worlds. Corruption that contaminated ours. What is the cause of the wars? Why is the second war forgotten? It was a war between the neighbour region (region name) and Saogheil (playable region). Saogheil has had 6(?) Royal familys and kings, the 4th one was the one who caused the first war, he was manipulated by a man to do so. The Madness Pokemon, created through sacrifice of thousands of lifes. He isn't from this universe. As he is originaly from a different universe. His form changes based on who created or owns him. Writing from other worlds, required for the creation/summoning of the Madness Pokemon. These runes are the start of the corruption that mutated the region. These runes also brought to existence new unown forms. The corruption over time also started mutating the living being in the area (origin of regional variants of saogheil). The corruption was very slow in the beguinning almost unoticeable. The birth of (name of madness Pokemon) took a long time to happen, exactly 2 years after the 1.5 year long war. In order for the creation to succeed. The war was required to end and for the resting phase to start, but that was taking too long in this world. During the first war, the 4th King was blamed, quickly becoming a public enemy, losing his title 5 months prior to the conclusion of the war. The man who had manipulated him, ended up earning the title of temporary king. He was smart, and was the one who ended the war, something the 4th king was not capable of. (Lost? Won? Truce? = what happened to the war). After the end of the war, everyone in the region loved him, where he acquired the title of King permanently, becoming the 5th King. Now even if the summoning failed, he had acquired power and money and a region to govern, something he always wanted. He was set for life. Or so he thought. The madness Pokemon was born (prematurly?) in a dungeon, deep underground under the castle. His awakening represented the last day of peace for a long, long time. He looked deformed, intimidating, and always ready to fight. Upon his escape from the summoning circle, every rune in the region was fully activated, corruption accelerated to enourmous and dangerous levels. As a Pokemon not originaly from this world, he had trouble taking the correct shape. He was furious and he already is a very angry, fierce and savage creature by default. For him everyone is a foe. He is capable of manipulation, anyone that simply sees (or maybe hears?) him becomes angry and attacks anyone around them, humans and pokemon alike. He is in constant pain, and tries to run back to a world he can fully form, but that is not possible. When they are born, they are bound to that universe. Everytime he tried to escape to another world, he was rejected by the portals, unable to go, he became angried and madder. The 5th King, didn't expect the Pokemon to be uncontrollable. Completely unlike what he had read in that book. A long time ago he had found an abandoned house/cabin, one he had found when he was younger. (He had found objects he had never heard or seen before). There were a couple of books present in that house, one contained the details about the madness Pokemon and what is required to summon it. There were a couple other books , runes, history, and about Pokemon he had never heard before etc. But, there was also one for Portals. They are used to go from world to world, in the book it says that they are supposed to be used only in emergencys, but people used them for various reasons. He used these to try to banish the pokemon to another world. As he was scared and unable to control the beast he had created. Story villain = What are his motives? After first learning about the untold history of the Dimensional War and what happened to that Pokemon. He decided to get him back, as he learned that, he is part of the bloodline of the 5th King. That Pokemon belonged to his family, and to him. He found a way to get him back and capture him ( still deciding if that would mean the restart of the war, or if the pokemon will end up being controllable and not beserk). Acquiring the pokemon back by awakening him, as he is currently in a different form that put him in complete stasis. And use this pokemon to destroy and dominate the region that once denied his family. His team/admin/followers were promised a place at the top once he gets everything. >Required the power from the no longer activated runes (so, they need to be re-activated). >Some of them have been drained of their energy, as that energy has latched onto some unlucky/lucky people, people who acquired powers connected to language/understanding/comprehension. >Something that belonged to the original creator of it (I will use the royal crown that is located in a museum for this in the story). >To control the pokemon, he will use technology and research of Maddox, a scientist in the game whose research is all about manipulation and limitations. I'm sorry if its, very very long.